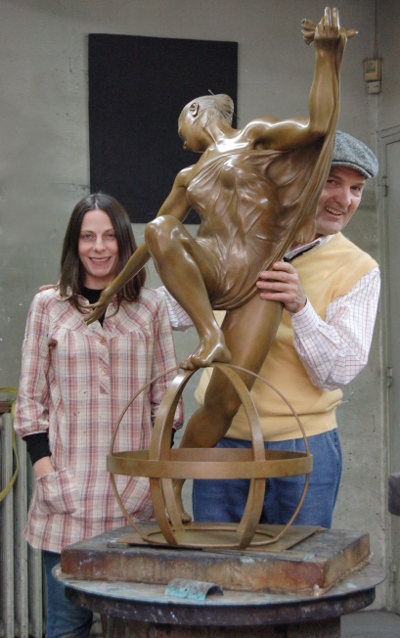 Isabelle, specialist of the patina at the Susse Paris foundry and the sculptor on the day of the finishing of the sculpture «Harmony». Born on October 20th 1949 in Brittany at Guer, he had learnt to create from early childhood in his parent’s wooden toy factory. While studying he tried out woodcarving. He became a physiotherapist in 1977, leaving sculpture aside. Through much observationand workhe had discovered how the visible part of the human body harmonizes with the anatomy of the underlying organs, muscles, bones and tendons that cannot be seen. This harmonizing process follows very specific laws through invisible phenomena. Harmony between visible and invisible matter is the hidden secret of the alive emotion which makes the inert bronze matter becoming lively. …« The essential idea that I wish to convey from a sculpture is given birth inside my head through inspiration. From the moment this 4th dimension becomes precise and stable, the adequate model appears spontaneously in front of my look if I close my eyes. This model is an energy wave gestating a form which becomes visible inside my head. This model perfectly expresses the essential idea, looking like stripping off my own emotions while getting out of a bath into a spring which is not mine. Jean Paul Floch had decided neither to deform nor to caricature the soul’s clothing, and he had become a professionnal sculptor in 2002. However, since 2006 he could not create anywork of art because a Social Body had falsified a legal text in order to deceive him. So, payment of not owed heavy taxation had stopped his own financial potential. Justice Court had disregarded the falsified legal text. Moreover, the sentence is not even accounting reliable, unless to place oneself in an illegal situation. Rareness of his works follows so from a very long ill-treatment by french Administration. From now on, Jean Paul Floch turns his attention towards abroad, so as to make his creative potential alive again. His artistical sensitivity feels very much attracted by the cultural heritage of Russia.